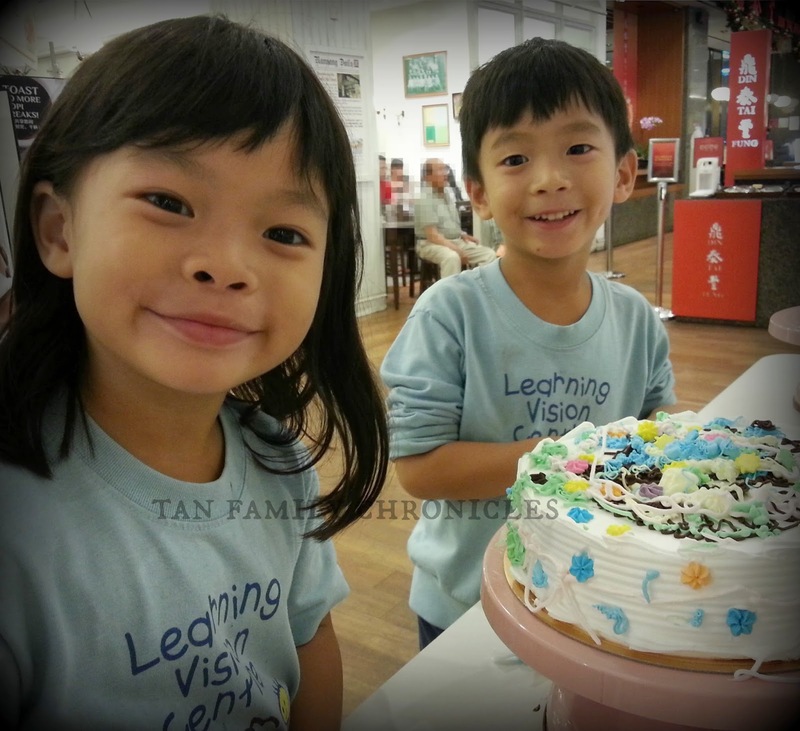 Tan Family Chronicles: Asher & Shawna are Five! 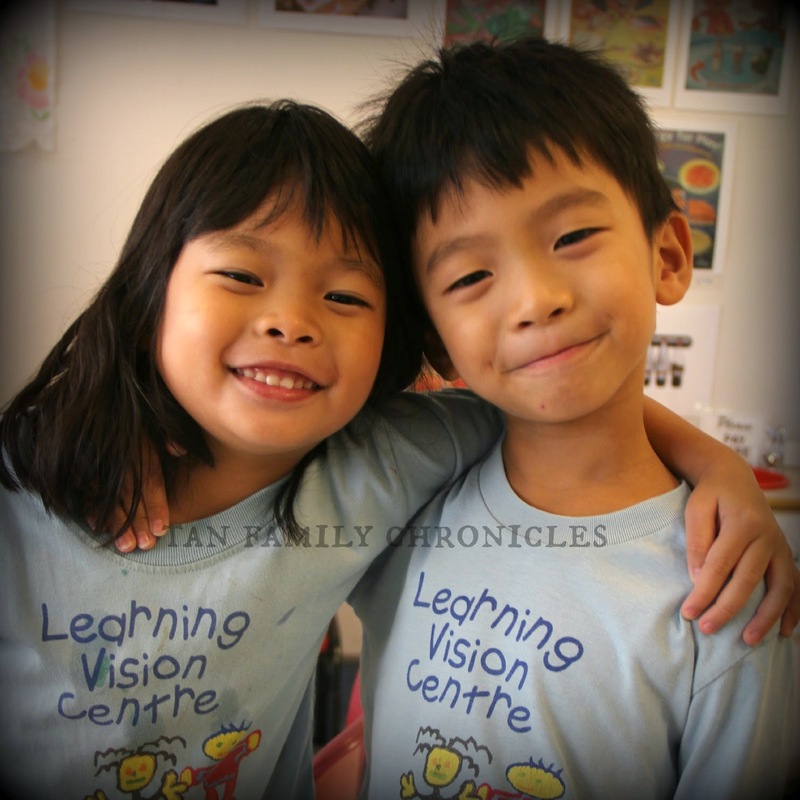 Asher & Shawna are Five! In a blink of an eye, the twins turned 5 years old this year! Well okay, not literally a blink, but it really doesn't seem too long ago when I posted the birth story of the twins. Just as I am writing this post, I am feeling a bit guilty about the fact that I blogged less about the twins, than I did about Isaac when he was younger. For after all, I did start this blog for the purposes of chronicling the childhood of the kids. And for the record, it is not the case that I blogged less about the twins because I love them less, or any silly reason like that. The first year after the twins' birth was physically tough. We were stretched to the max, caring for the two infants, plus toddler Isaac to boot. And just when the twins were about to hit one year old, I started My First Games. I figured if I didn't at least try, I would never know how it pans out. So while I had a full time job, a sideline online business, and three young children to love and care for, I simply couldn't and didn't blog as much as before the twins came along. Now that the kids are older, they value our company with them even more, and that leaves us less personal time now than when they were infants. But it's all worth it. THEY are worth it. Hubbs and I love the kids to bits, and my only regret is that I didn't take more photos and videos and blog more about their exploits before I forgot the details of the anecdotes. Thus, I hope to blog more this year. They may not be in strict chronological order, but 20 years down the road, I really don't think it matters whether it is or not. Shawna & Asher the Tan Family Twins, and best buddies for life! I love that picture above! It truly epitomises their relationship - they're best buddies! All through their lives, they had each other to play with, to fight with, and to depend upon. Yes, they do fight, as all siblings inevitably do, but they love each other fiercely and would not hesitate to defend and protect each other if they sense that their twin is in danger of being bullied or hurt. 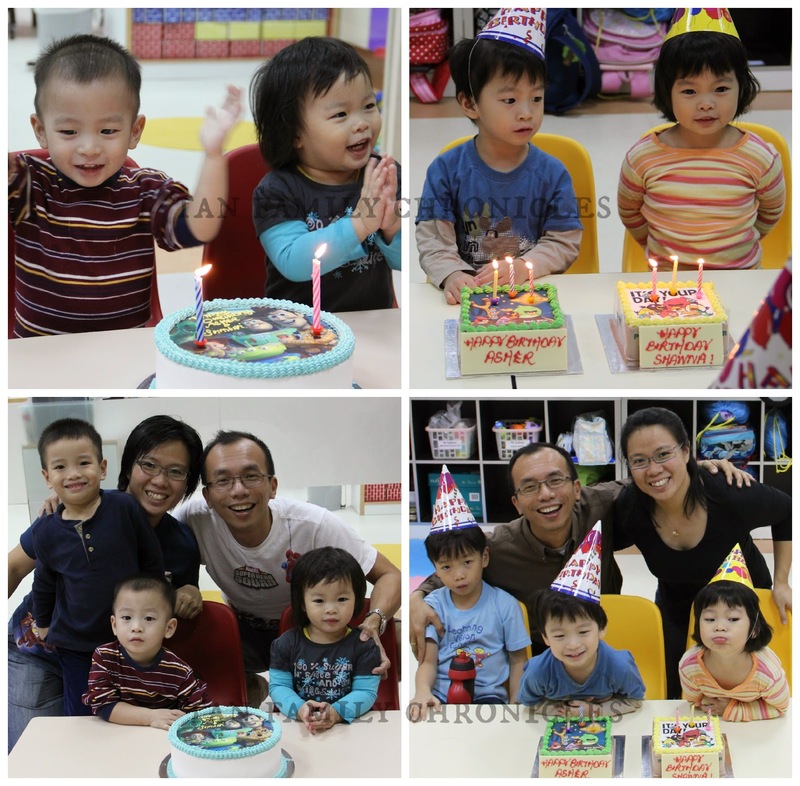 The Asher & Shawna's birthday celebrations in school at age 2 and 3. The second year, I ordered a 1kg Toy Story cake. I figured Toy Story was quite unisex, right? The third year, I decided, that since the price of two half kg cakes was about the same as the price for a one kg cake - I chose to let the twins each choose a cake of their own. Asher chose an Angry Birds chocolate sponge cake with green trimming - green was his favourite colour then. And Shawna chose an Angry Birds vanilla sponge cake with yellow trimming - her favourite colour then. On their fourth birthday, we were very kindly sponsored a magic show, so we threw them a party. For that celebration, I ordered a lovely rich dark chocolate fudge cake from Cake Crafters and inserted our own action figures as cake toppers. Asher loves chocolate and chocolate cake, you see. It was so decadent, but supremely, satisfyingly delicious! :p For Shawna, I ordered an Elmo jelly cake from Food Mapping. That worked out remarkably well, as none of us had to suffer from an overdose of cake. But this year, I decided that the kids would get to decorate their own cake. We've been doing this for a few years now, for my birthday as well as hubbs' - we'd have the kids decorate a cake for us. We didn't mind how beautifully artistic the cake looked. I simply assumed before, that the kids would prefer some cartoon character cake for their own birthday cakes. Now, I know better. They love love love decorating their own cake. So that's what they got to do on the eve of their birthday, decorate the cake which we'd bring the next day to their school for their actual day celebration! They were very pleased with their masterpiece. Much cheaper than the average cartoon cake too! Shawna & Asher with their masterpiece: their own birthday cake! Thinking back, the money and effort we spent for the twins' 4th birthday celebration party was really quite worth it. I say this, because, the twins remember it very well! At least Shawna does. She kept on talking about it the entire year! Every now and then, she would mention something about the party, and how she wants the same magician, and the same chocolate cake and Elmo jelly cake for her 5th birthday celebration, at the same venue, even! She would mentally list the friends and family she wanted to invite to her party. I had to tell her that there likely wouldn't be any party, and that disappointed her quite a bit. However, we did tell her and Asher, that they'd have a birthday treat. And that was, we'd go to Legoland! They've been wanting to go for ages, so it was a good distraction and she didn't make too much of a fuss over not having a party. We were busy for most of December and so we could only make it to Legoland on 31st December 2014. We actually paid full price for the tickets as I had forgotten to bring some promo chits that I had prepared for the trip. But in consolation, Legoland was having a promotion where if you paid full price for tickets, you would get another ticket per ticket for free entrance to the park in January this year. So we're going to go Legoland again this weekend! Technically, it's half priced then. Hah! 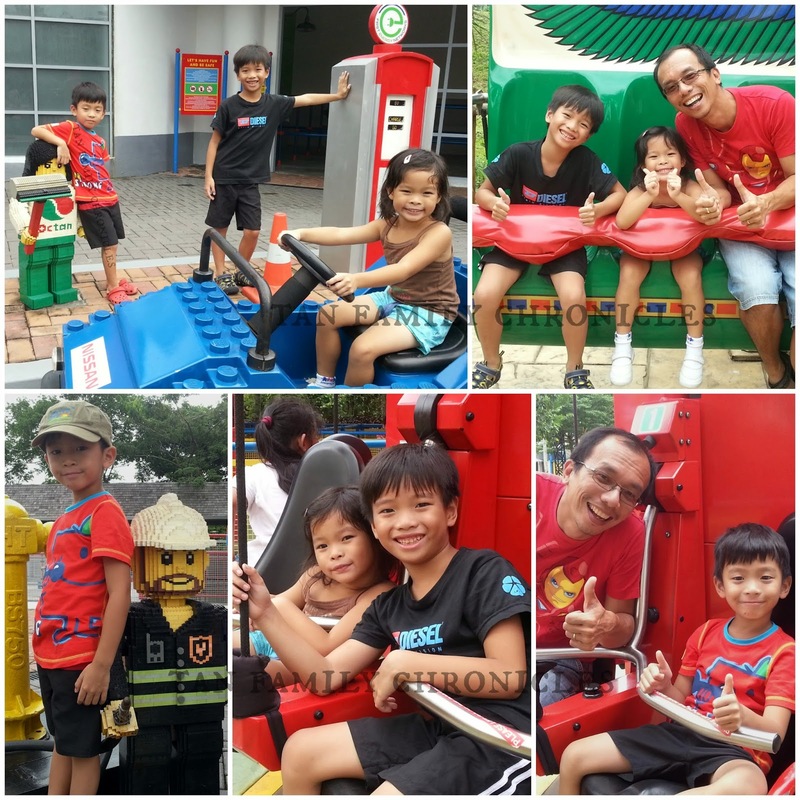 Asher & Shawna's birthday treat - Legoland! The kids had a grand time. They absolutely loved Legoland and the rides. So did hubbs and I. We got to sit more rides this time round as the kids were older. The first time we came to Legoland was a few years back when Asher and Shawna were still quite young, and not tall enough for most rides. They are taller than 100cm now, so they got to sit most rides this time. Legoland on the 31st of December, despite being a public holiday eve, was not crowded at all. This meant that we didn't have to queue for almost all the rides, and could go multiple times for each ride. And it was cloudy all day, but did not rain - which meant, it wasn't hot at all! We were blessed with the perfect weather that day! The actual day of their birthday fell on a weekday. Hubbs had a meeting and couldn't step away early to go to the kids' school for the school celebration. So I picked Isaac directly from school, and we went to the twins school for the celebration. After which, we went to pick hubbs from school, and went for dinner at the kids' favourite xiaolongbao restaurant. Here are the kids, clowning around while waiting for their Daddy to be ready to go. The boys love to play fake fighting. Show off their kung fu moves. And the kids were in sufficiently high spirits that they willingly posed for pictures for me. Isaac, Asher & Shawna :) siblings love! Ha! Getting the twins to decorate their own birthday cake is a brilliant idea.